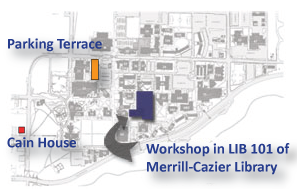 Our workshop will begin with registration at 8:15 on Monday, October 22, 2012 in the Merril-Cazier Library, Room 101 on Utah State University's main Logan Campus. ​LIB 101 is your first left when you come in the entrance to the library. See here for an interactive campus map. All Logan class room sessions will all be in LIB 101. We will provide transportation to field sites.